OUTSIDE BAGHOUZ, Syria (AP) — A prominent French militant who joined the Islamic State group, Jean-Michel Clain, died over the weekend from wounds suffered in an earlier airstrike that killed his jihadi brother, his wife said Tuesday as she emerged from the group’s last pocket of land in Syria. The wife, who identified herself only as Dorothee, said another French woman who had joined IS, Hayat Boumeddiene, was killed in another strike in Syria last week. Boumeddiene had been wanted by French police as a suspected accomplice in a 2015 attack in the Paris region. Dorothee was one of hundreds of people who on Tuesday streamed out of Baghouz, the last village held by the Islamic State group, under stepped-up assault the past four days by U.S.-backed forces. The latest wave of evacuations brings the final defeat of IS by the Kurdish-led Syrian Democratic Forces one step closer — a milestone in the devastating four-year campaign to defeat the group’s so-called “caliphate” that once covered a vast territory straddling both Syria and Iraq. Dorothee, who is also French, told the Associated Press that the situation inside Baghouz was a “horror film,” saying there is a “massacre” inside, with constant shooting. People had to lay flat to avoid the crossfire, she said, adding that her 7-year-old daughter was killed and her other daughter wounded by an explosion two weeks ago. Her account closes a chapter on a number of French militants who were connected to attacks in past years in and around Paris and who then made their way to IS’s “caliphate” and finally, as it crumbled, to this tiny village on the Euphrates River near the Iraqi border. Her husband, Jean-Michel Clain, was wounded in a Feb. 20 airstrike in Baghouz that killed his brother, Fabien, one of Europe’s most wanted IS members. The U.S.-led coalition announced Fabien’s death several days after the strike. The two brothers joined IS together and Fabien went on to become the group’s voice in France. Fabien’s voice was on an IS recording claiming responsibility for the worst terrorist violence in France’s modern history — a series of bombings and shootings in Paris in November 2015 that killed 130 people. Jean-Michel held on for a little over a week after the airstrike. Dorothee said she tried to treat him, but his feet were torn apart and one side of his body was crushed. “He suffered,” she said. “There was no hospital.” He died on Sunday, she said. Boumeddiene was killed in a separate airstrike in Baghouz about a week ago, Dorothee said. Other French citizens who left Baghouz on Tuesday said Boumeddiene was believed to have been staying in a house used by French citizens that was hit last week. Boumeddiene was the widow of Amedy Coulibaly, a Frenchman who attacked a kosher supermarket in Paris in January 2015, days after two other militants — brothers Cherif and Said Kouachi— gunned down the staff of the weekly satirical magazine Charlie Hebdo. Coulibaly killed four people in the supermarket before French police stormed in and killed him. The Kouachi brothers were killed by police in a separate raid. All told, their attacks left 17 people dead. Investigators then focused on finding Boumeddiene, who was believed to be pregnant at the time. But she had already fled to Syria. Soon after, IS published what it said was an interview with her in French and English, in which she called on women to be patient and make life easier for their husbands. Dorothee said Boumeddiene remarried in Syria. Boumeddiene’s evolution was documented in photos widely distributed in French media after her disappearance, from vacation pictures of her in a bikini to images of her holding a crossbow while wearing an all-encompassing black niqab. The last known image of her was from airport surveillance video in Istanbul, going through passport control. 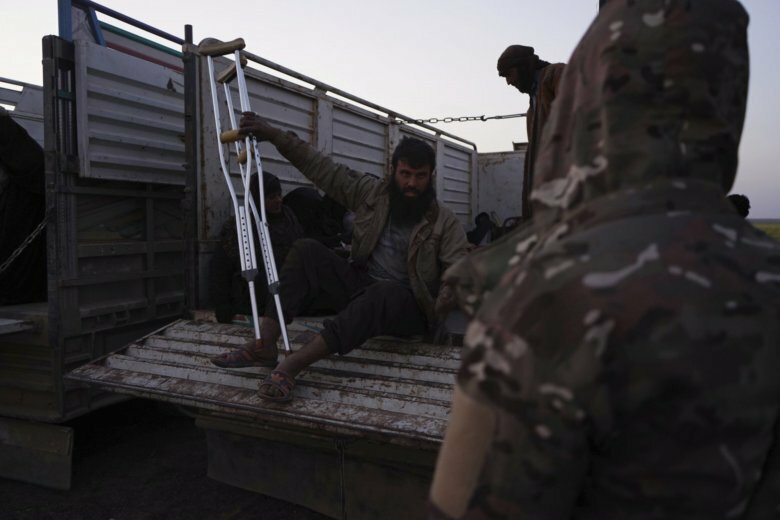 Tuesday’s exodus came three days after U.S.-backed forces resumed their push on IS militants holed up in Baghouz. The assault had been slowed the previous week to allow thousands of civilians, including IS family members, to be evacuated from the tiny pocket of territory. As many as 10,000 people who had been squeezed into the eroding patch of land, are estimated to have streamed out — an enormous number that stunned the SDF. Another woman in her mid-20s, who identified herself as Reem from the central Syrian province of Hama, said she was waiting for her husband to come out of an IS-controlled jail. He has been there for months after killing an IS member in retaliation “for his baby daughter being killed in an airstrike,” she said. The evacuees said the bombing has been intense in recent days. One woman said she saw a man hit by a missile as she was fleeing from one tent to another. Earlier on Tuesday, SDF spokesman Mustafa Bali tweeted that about 3,000 people came out of Baghouz on Monday. They left through a humanitarian corridor established by the Kurdish-led forces for those who want to leave or surrender. Since Feb. 20, more than 10,000 people have left the IS pocket and black-robed women with children in the backs of trucks could be seen passing through the corridor and heading into the desert. They were then whisked off to a camp for displaced people to the north, while suspected IS fighters were moved to detention facilities. It was unclear how many IS militants and civilians remained inside, but the number is now likely in the hundreds. Associated Press writers Nataliya Vasilyeva in Moscow and Lori Hinnant in Paris contributed to this report.